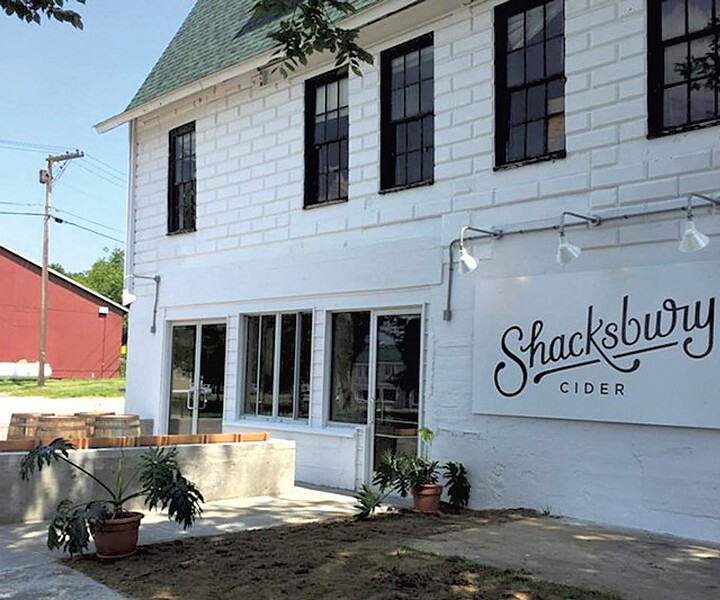 "It feels like Shacksbury is kind of having a moment," said Alex Consalvo, director of sales and marketing at the Vermont cidery. On October 28, the business will celebrate the grand opening of its new tasting room at 11 Main Street in Vergennes with food, live music and plenty to drink. Also in the works is a collaboration with celeb chef David Chang's restaurant group. The cidery is on the verge of launching a beverage with the working title Momofuku Cuvée, which will be sold at Chang's Momofuku restaurants nationwide while supplies last. The limited-edition brew is made from wild Vermont apples and wild yeast, plus a small percentage of a "cleaner" cider containing cultivated yeast and apples from Sunrise Orchards in Cornwall. "This batch is one of a kind," said cofounder and cider maker Colin Davis. "We did 120 cases, a bunch of kegs and a few magnums." The collaboration came about after Consalvo became friends with the beverage director at New York's Momofuku Ssäm Bar. The latter was looking for a cider to pair with the restaurant's fusion fare, such as banana-leaf-roasted skate and steamed buns stuffed with caviar. That led to a beverage built "from the ground up" by Davis and the restaurant group's beverage director, Davis said. Although Vermonters may not get to taste this particular batch, Consalvo said he hopes to keep working with Momofuku in the future and to sell some of the special-edition ciders locally. Davis noted that Shacksbury already sends kegs of one-of-a-kind cider to local eateries, such as Winooski's Misery Loves Co.
One more piece of hoopla: Next week, at the 500-person gala dinner in New York City preceding the auction of Paul Newman's famous Rolex, servers will pour Shacksbury cider, Davis said. The original print version of this article was headlined "Liking Them Apples"
Food News Vergennes cider tasting room Momofuku Cuvée David Chang Momofuku Shacksbury Cider Shacksbury Tasting Room Misery Loves Co.